BRATTLEBORO, VT (May 15, 2017) — Which states are most into local food? That question is answered by the sixth annual Locavore Index, which ranks the 50 states (plus the District of Columbia and Puerto Rico) in terms of their commitment to local food. The Index, which uses seven different data sets reflecting patterns of local food consumption, is researched and compiled by Strolling of the Heifers, a non-profit food advocacy organization based in Vermont. 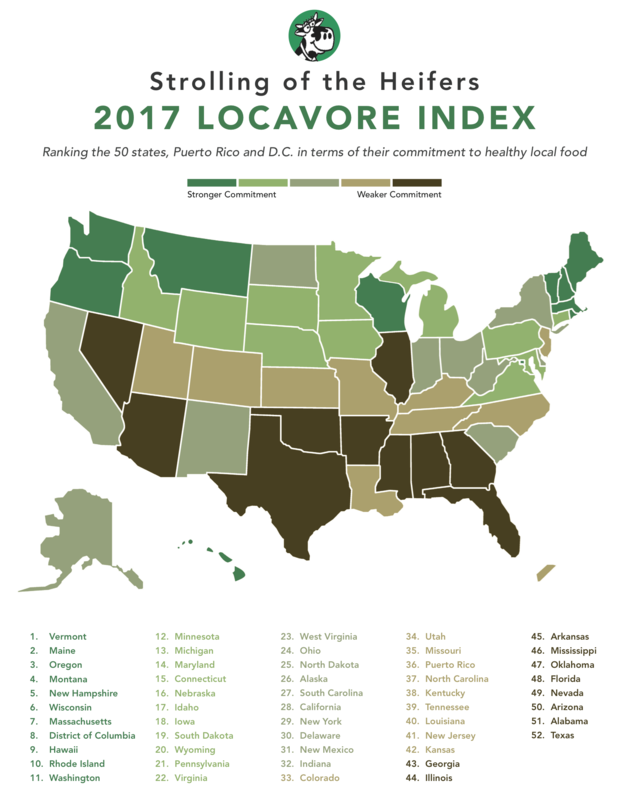 According to the 2017 Locavore Index, Vermont, Maine, Oregon, Montana and New Hampshire (in that order) demonstrate the strongest commitment to local food. Vermont has led the Index since its inception in 2012. Rounding out the top 10 are the District of Columbia, Wisconsin, Massachusetts, Hawaii, and Rhode Island. The 2017 Index incorporates a new metric: the number of hospitals that have committed to sourcing food locally, relative to each state’s population. That information came from the organization Health Care Without Harm, which tracks the number of health care facilities that are purchasing and serving local foods through its Healthy Food in Health Care program, along with its sister organization Practice Greenhealth’s Healthier Hospitals Food Challenge. The hospital data produced strong upward moves for several states, Langeveld said. Among them were Washington (up 5 places), Michigan (+8), Nebraska (+6), Ohio (+8), and California (+8). Along with the hospital data, the 2017 Index also incorporates updated information on the number of farmers markets, the number of CSAs, the number of food hubs — all compared on a per-capita basis — along with updated date for each state’s USDA grants relating to food production for local markets. The index continues to include data from the USDA’s Census of Agriculture, including data on the dollar volume of direct-to-the-public food sales by farmers. But since this Census data has not been updated since 2012, its weight within the Index has been reduced. A new Census of Agriculture will take place later in 2017. Know your Farmer, Know your Food grants and Specialty Food Block Grants are given by the USDA to help communities scale up local and regional food systems and strengthen their economies. They include funding for food hubs, farmers markets, individual farmers, farm cooperatives, schools and other entities. The Index ranks states on a per-capita basis for the total amount of grants received by each state over the period 2009-2016. Sources for the data used in the Index includes two regularly updated U.S. Department of Agriculture databases for farmers markets and food hubs; the 2015 USDA Farm-to-School Census; the USDA’s 2012 Census of Agriculture; the U.S. Census bureau (July 2015 estimates of population); the California-based local food resource directory LocalHarvest, a frequently-updated database of CSAs; the USDA’s database of Know Your Farmer, Know your Food grants covering 2009-2014 and its listing of Specialty Food Block Grants for 2016; and the organization Health Care Without Harm for data on hospitals that prioritize local food. The Index is calculated as the weighted average ranking in all of the component categories. The weighting is as follows: farmers markets per 100,000 — 10 percent; CSAs per 100,000 — 10 percent; Farm to School (product of participation rate and budget percentage) — 15 percent; Food Hubs per 100,000 — 5 percent; direct sales per capita — 25 percent; USDA Know-Your-Farmer and Specialty Food Block Grants grants per capita 20 percent; and hospitals sourcing food locally 15 percent. 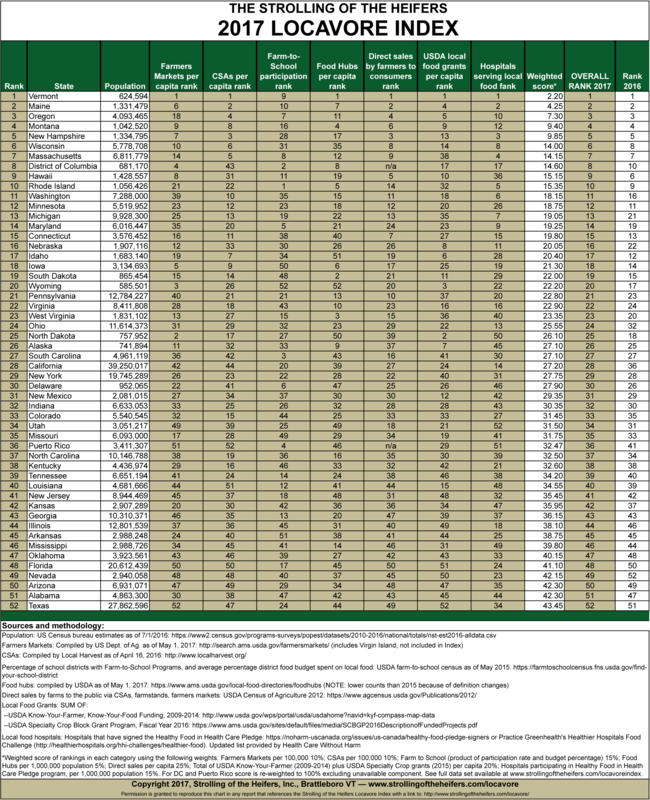 The full data set spreadsheet with formulas is available at www.strollingoftheheifers.com/locavoreindex. Strolling of the Heifers is a farm and food advocacy and economic development organization based in Brattleboro, Vermont, building a record, since 2002, of spotlighting the benefits of strong local food systems and encouraging innovation and entrepreneurship in farm and food businesses. While Strolling of the Heifers is best-known for a whimsical weekend of events built around an agriculturally-themed parade, featuring well-groomed heifer calves led by future farmers that takes place this year June 2-4, the organization has focused its year-round programs on economic development work in the farm and food sectors, with the specific goal of creating jobs by working to foster small business entrepreneurship. It does this through Windham Grows, a “business hatchery” currently working with its first cohort of small businesses, and through the Slow Living Summit (a farm/food entrepreneurship conference), and the Farm-to-Table Culinary Apprenticeship Program. For further information about the Index, please contact Martin Langeveld, Strolling of the Heifers —martin@strollingoftheheifers.com or 802-380-0226.